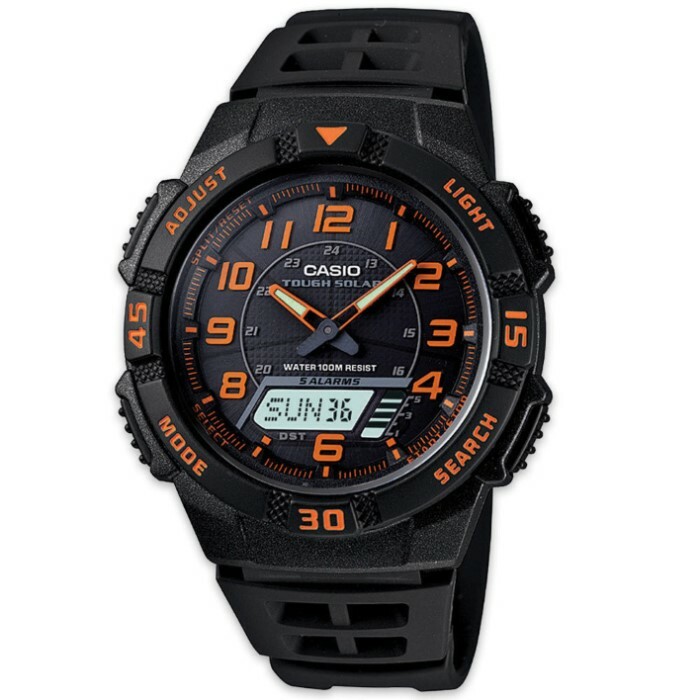 Perfect for any sport, this sport watch from Casio utilizes an innovative self-charging power system with a combination analog and digital display. A multitude of additional features includes a 48-city world time, five alarms, a stopwatch and dual countdown timers for interval training, and much more. Water resistant to 100 meters. Bought this watch a while back it works great. After a coke years I had to reach it but it is well worth the money. I just got this in the mail, and I'll be the first to say its a nice looking $40 watch. The straps feel a bit flimsy, but I believe they will hold since they are each attached with a small metal pin. I expected the watch to be bigger, but small has its advantages too. This watch is VERY light weight, and aesthetically pleasing. Unfortunately, the numbers don't light up, but there the hands are glow in the dark. Instructions for set up were fairly simple, and it took me about 5 minutes to completely customize. Overall pretty cool watch, can't beat solar power. I will try to comment in a few months, to let reader's know if the watch is still functional.